The beauty is only skin deep. But I only take it around town. Well, I have Celeste cable housing by Jagwire. While I rode it I changed out some components. New Campy shift levers, built up new wheels when all-black seemed a good idea (originals were silver rims and sew-ups which i still have). These new wheels are Campagnolo Omegas i bought on closeout somewhere with 700c Vredestein Forreza clinchers and 32 hole Nuovo Record hubset. i swapped the original Cinello black suede Unicantor seat for the Cinelli you see here, black Modolo brake levers, swapped the original stem (3TTT?) for the Cinelli 1R, ugly LOOK pedals (originally Campy Gran Sport), Super Record headset (i think), original was a rough feeling Gran Sport headset. You'll notice i also added three stickers to the frame. 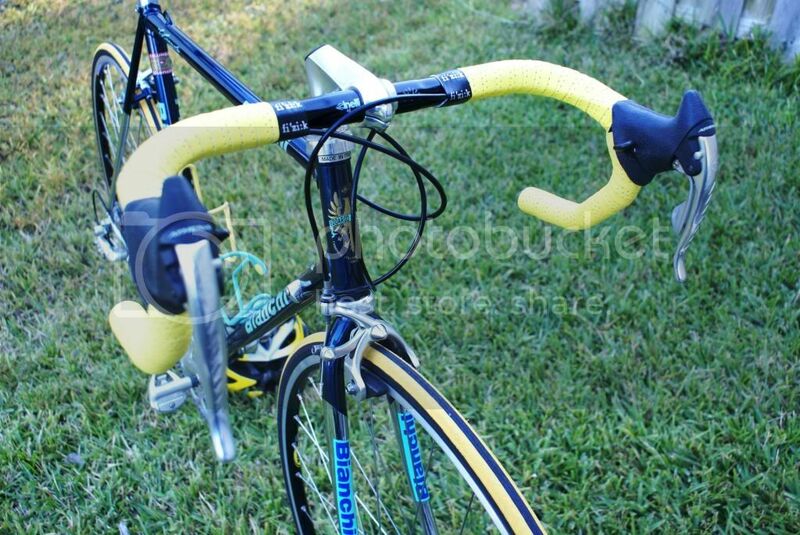 one large blue script Campagnolo on drive side of the TT and two small oval yellow and blue Campy stickers to the front and back of the seat tube. i was young. i needed the money... 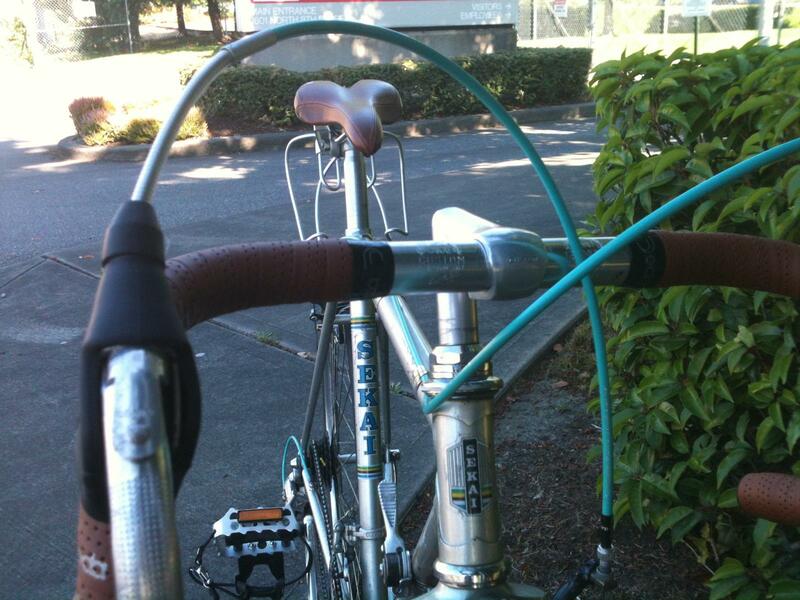 If i remember correctly, Columbus Tretubi was SL on the main triangle and SP on the seat and chain stays. forgive the drawn-out post but i was figuring if anyone could appreciate the details i've offered, this forum would. Last edited by ericzamora; 11-15-12 at 06:29 PM. 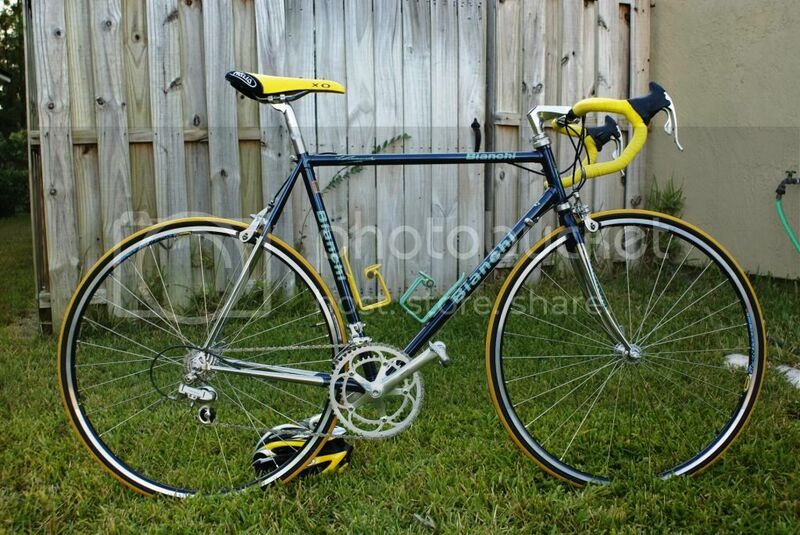 Just bought it, will be putting the proper Ritchey stem back on it and turning it into my commuter with Nexus shifting and brakes. 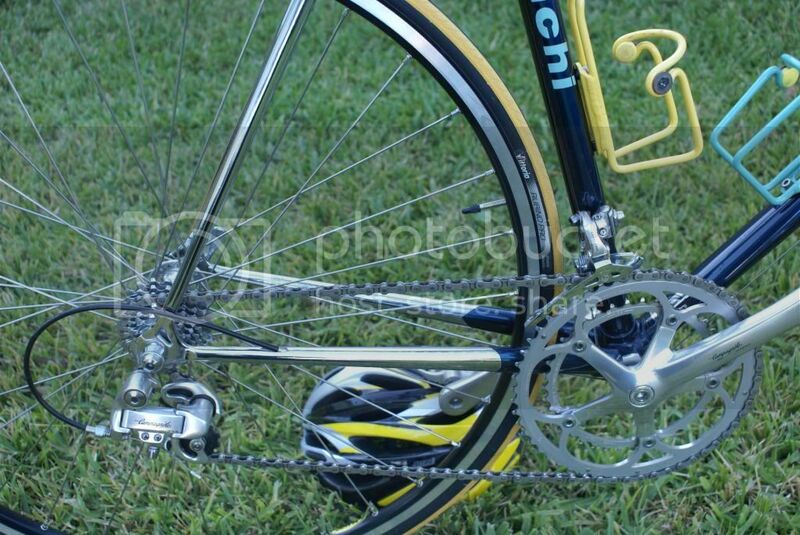 This is a 1985 Campione d'Italia with a quixotic mix of 21st century Centaur and Chorus componentry. The Record hubs are from 1998. I've actually just had the frame sandblasted and powder coated, and have already re-applied the decals, but I haven't gotten around to taking any photos yet. Is the black Bianchi built with EL OS? Man, I've been looking for a 61cm c to c for a long time. Anyone sees one, PM me please! Highgear if you look up about two post you'll see it is TSX-UL. I suspect that would be a great riding frame even in that size. It may be even harder to find but don't over look a Mini MAX if you see one. My understanding is EL OS ovalized in the MAX pattern to make an even lighter frame. Bianchi only offered on year (plus the leftovers) and I only ever saw one but it was a great fraem a quite a leap forward from the owners old alloy Vitus. Chuck great looking Giro and great pic! Last edited by Bianchigirll; 12-26-12 at 09:34 AM. 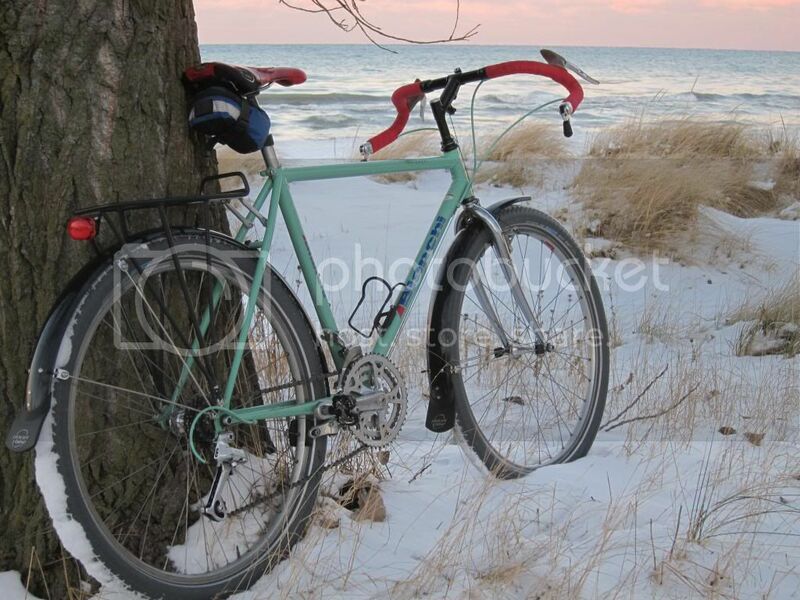 Not sure how I missed this thread - the bike has been sold but it was very good to me and I'd probably buy another if I found one. 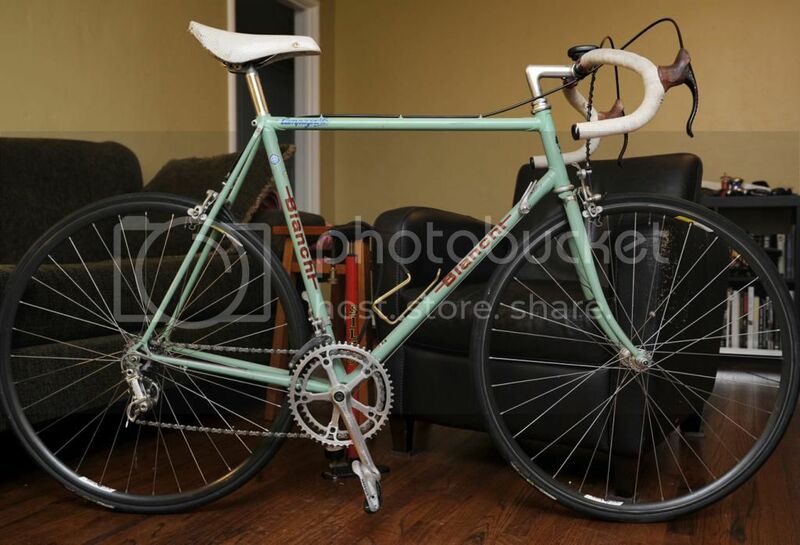 Only bike I ever bought brand new - 1997 Bianchi Trofeo (in September 1996). The wheels were heavy - I'd change that. 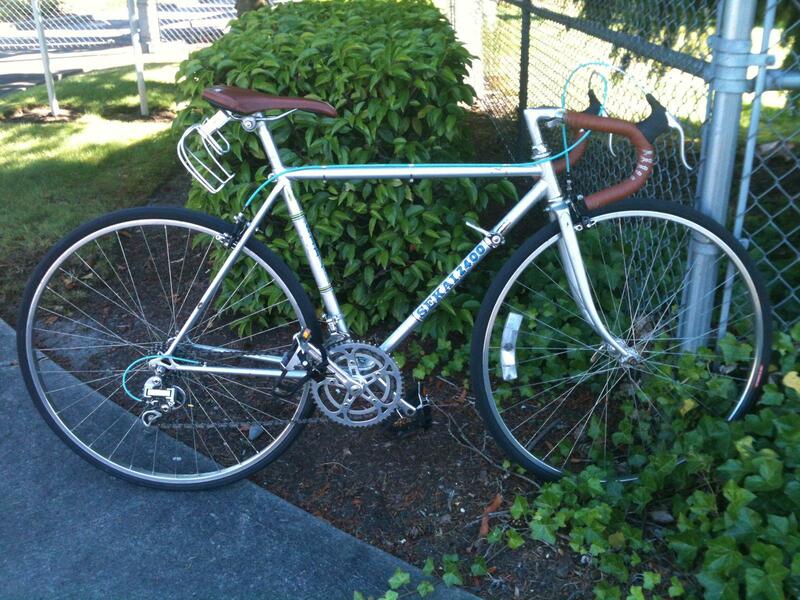 I swapped the Miche crankset (it's on my Nishiki now) for an Athena. Everything else was as it came except for tires, saddle and tape. Those Mirage shifters worked flawlessly for 14 yrs. As Robbie said - these are great bikes. After 10 months and 2 or 3 different group sets, I finally got it done. I have since put on a shorter stem, removed the dork disc, overhauled all the bearings, trued the wheels, replaced the cables, tires + brake pads and adjusted the deraillers. It is a very nice bike that rides and looks new. I really should have an "after" photo. 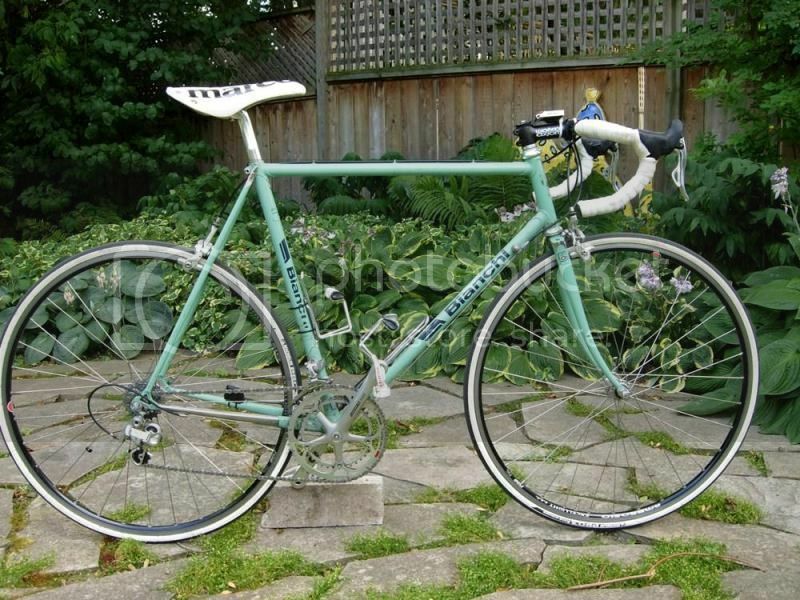 Personally, I never really got too into Bianchi because I don't dig celeste, but this one is sort of a pearly celeste. Sooo Pretty in the sun. And, it is *all* Italian. It is surprisingly light (a hair over 19 lbs according to my luggage scale) for a 14 year old steel entry level bike. Last edited by Rocket-Sauce; 03-18-13 at 08:15 PM. Celeste splatter Super Grizzly from 1989 or so. 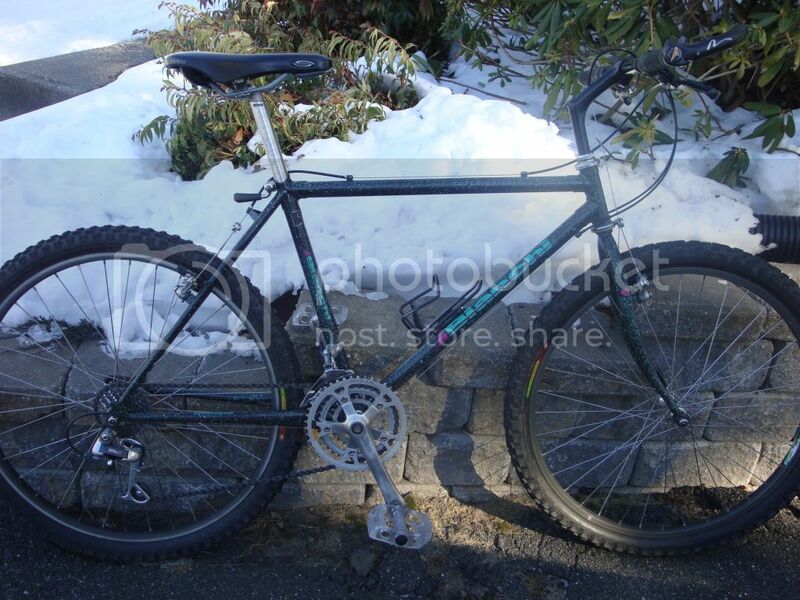 Had a great Bianchi during my Uni days in mid-80's at UGA Athens that I sold when I moved to Aspen with the mtb craze. Always regretted that. 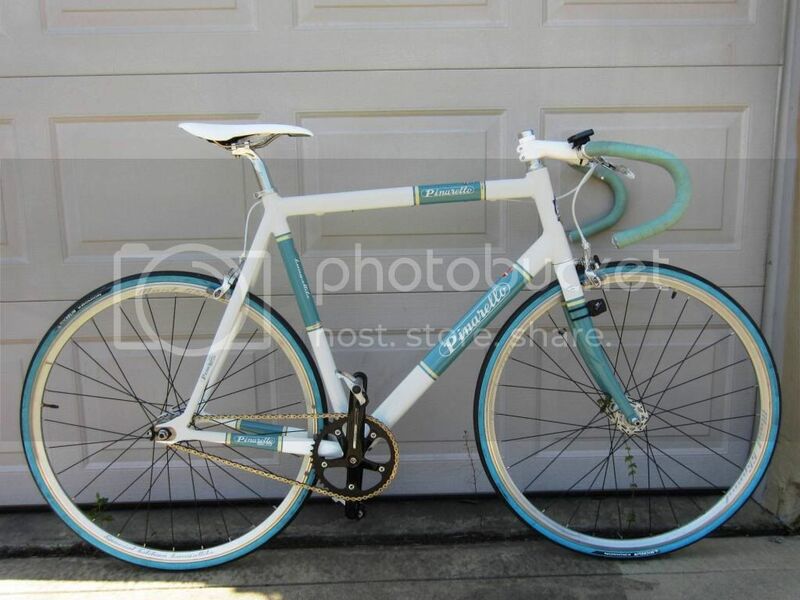 However, the bug has bit back and I have found a couple nice steel celeste Bianchi's here in Auckland, NZ. A 1989 Axis and a 1996 TSX UL. I am currently upgrading the TSX from Campy Mirage to Record. The Axis will be kitted with fenders and a rack for commuting. Apologies for the bad photo. Promise to post updates after the upgrades. Last edited by Dixie Kiwi; 05-31-13 at 08:17 PM. Last edited by Gary Fountain; 06-01-13 at 07:08 AM. I don't know very much about Bianchis, even though I have owned a few over the years. Yours and JR59's would certainly make me look closer at the brand in the future. Such great attention to detail. Was in parents' basement for 25 years. 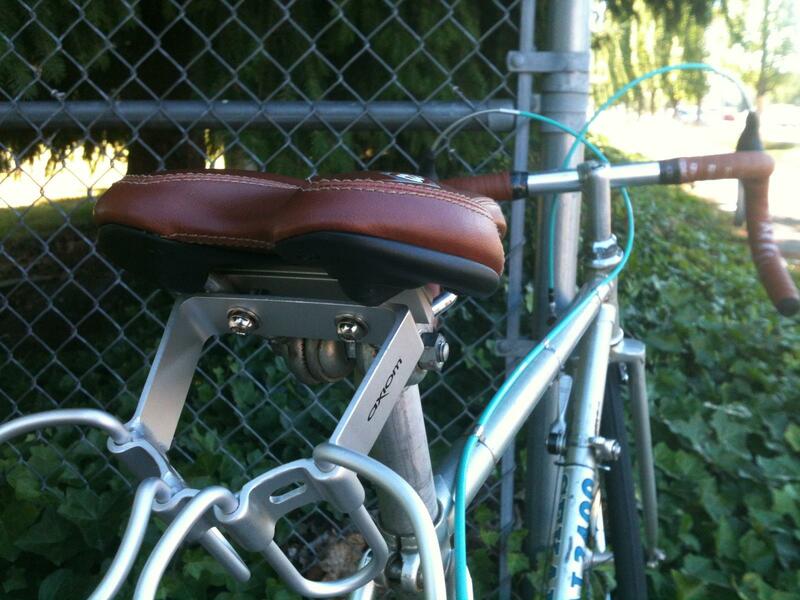 I broke my pedal cages so put on new pedals (and lock holder); everything else is vintage. As fast as ever.